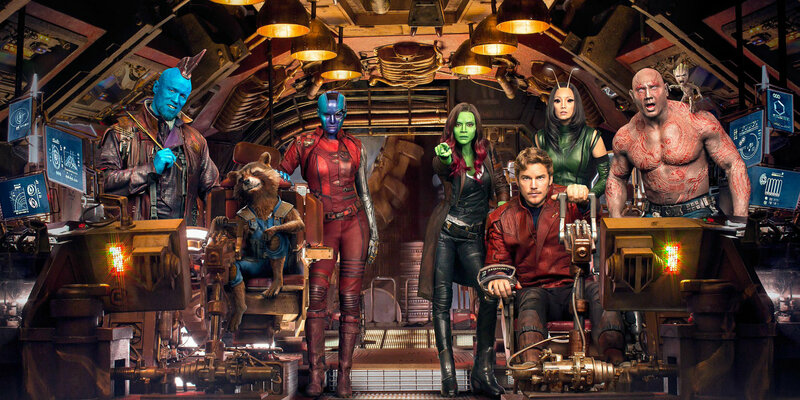 The first Guardians of the Galaxy film was a watershed moment for Marvel’s cinematic universe. Not only did it demonstrate that the franchise could expand beyond the core group of superheroes, but it also showed that even the zaniest ideas could succeed with the right combination of director and cast. The film did a lot to cure the genre fatigue that was beginning to haunt Marvel films. 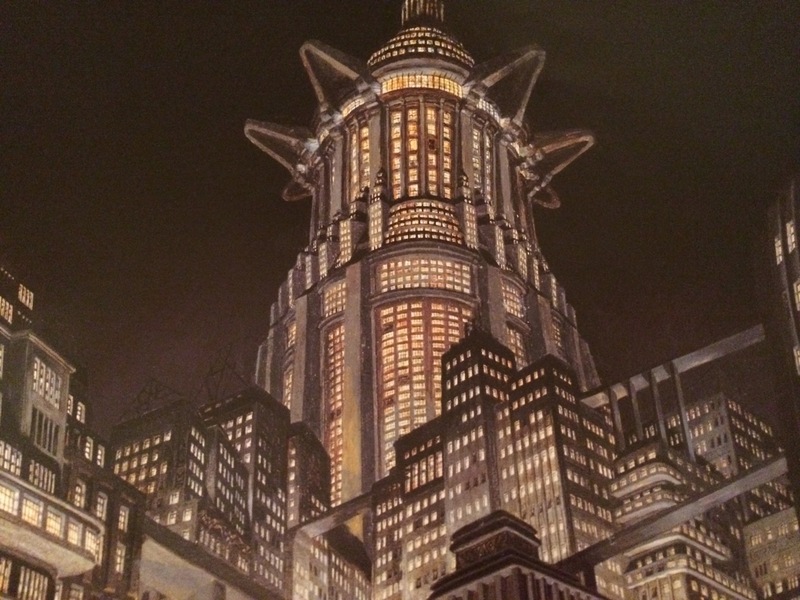 More broadly, Guardians of the Galaxy provided a new template for blockbusters which studios were quick to copy. It’s easy to chart this influence on subsequent films, with DC’s Suicide Squad adopting its nostalgia for classic rock music, and even the upcoming Thor: Ragnarok borrowing its 80’s aesthetic. Making a sequel to such an unexpected success was always going to be a difficult task. Director James Gunn needed to find a fine balance between revisiting the same elements that made the original film popular, but also doing something new with the material. Characters needed to grow. The story needed to evolve. And this ended up being my main issue with Guardians of the Galaxy Vol. 2 – despite the excellent cast, rollicking adventure, and awesome soundtrack, at times it felt like it was trying too hard to recapture the spirit of its predecessor. Minor spoilers ahead. Don’t worry – if you’ve seen the trailer, you’ll be fine. From the opening credits of this film, you know it’s going to be a lot of fun. The familiar Guardians team have really settled into their roles, finding that perfect blend of good characterisation and excellent comic timing. The banter and conflict between them is the highlight of the film. This time, the team is split up after a job goes wrong, sending them in different directions. This is where the film departs most drastically from its predecessor. The team dynamic isn’t as prominent as in the first film, yet it gives the characters a chance to grow individually before bringing them back together. In trying to recapture the success of its predecessor, the problem with this film is that it risks becoming self-indulgent, a parody of what it is trying to achieve. And here it walks a fine line. Gunn clearly recognises what made the first film so popular, and he heavily relies on the same gimmicks, especially our nostalgia for 1980’s pop culture. But some of these gimmicks are beginning to feel a little forced. They’re just not as fresh the second time around. As a consequence, some scenes cross the line into self-indulgence, whilst others don’t. Did you enjoy dancing Baby Groot from the end credits of the first film? If so, you’re in luck – dancing Baby Groot gets a whole dance sequence, which is hilarious and fun, but exists solely to satisfy the fans. If you’re a fan of the series, you’ll love it. If you pause to think about it, the whole thing starts to feel a bit stale. Guardians of the Galaxy Vol. 2 is a shrine to 80’s pop culture. Whereas the first film mainly relied on its soundtrack to convey 80’s nostalgia, coupled with occasional visual gags and pop culture references, the sequel takes this to a new level. It is overloaded with cringeworthy 80’s pop culture, from sound effects that are straight out of arcade games to a string of cameos. Even the colour palette is pure 80’s, with aliens vomiting neon fluid. This homage is thankfully dialled down in the third act, allowing the film to focus on resolving its plot. I’ve always loved the idea that the young Peter Quill turned his love of 1980’s pop culture into a type of personal mythology – it forms the heart of his character, lending an innocence to Chris Pratt’s goofiness. But, by the end of the film, I felt something akin to a hangover from too much 80’s. One of the unresolved plot threads from the first film, the identity of Peter’s father, is revealed surprisingly early in Vol. 2. It was also covered extensively in the trailers, so it’s no secret that Kurt Russell is playing Peter’s father, Ego. Their burgeoning relationship becomes the emotional focus of the story, eventually drawing all other characters into its orbit. It is equal parts sentimental and comedic. Kurt Russell channels the same arrogant swagger as Chris Pratt, making it easy to believe they are related. A part of me was a bit jaded about having another Marvel film focused on father issues – at this point, it’s easier to count the number of heroes in the MCU who don’t have unresolved father issues. But that seems to be a common convention in genre franchises these days. 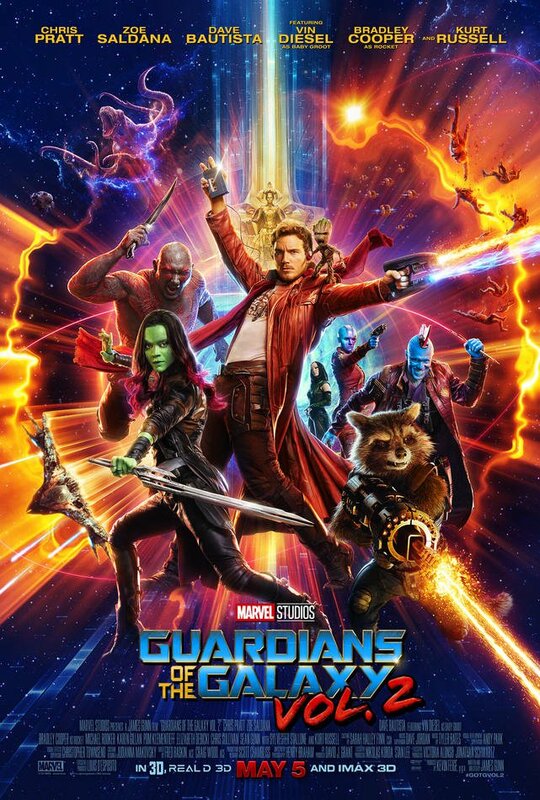 With the Guardians team split up for this film, following their own journeys, most of the movie is spent switching between them. And there are some interesting storylines here. 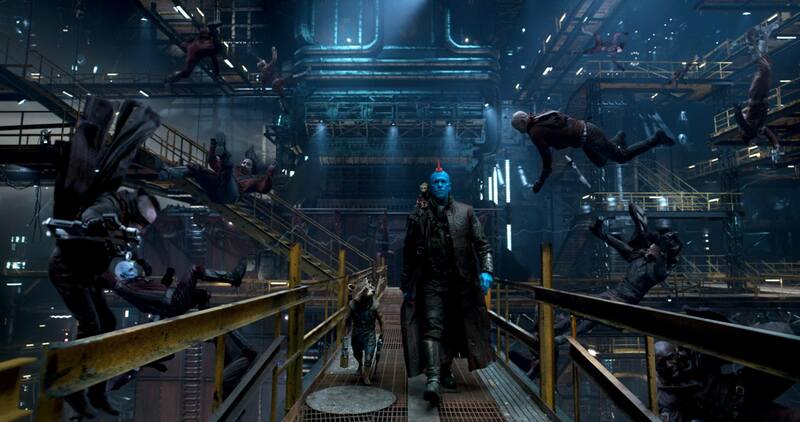 Yondu (Michael Rooker), in particular, plays a much more significant role than in the previous outing, coming close to stealing the entire show. The relationships between Gamora and Nebula, and Rocket and Yondu, are given a depth and meaning that lend real emotion to the film. It feels strangely appropriate that the sequel to a film about losers – “I mean like, folks who have lost stuff” – is about the importance of family. 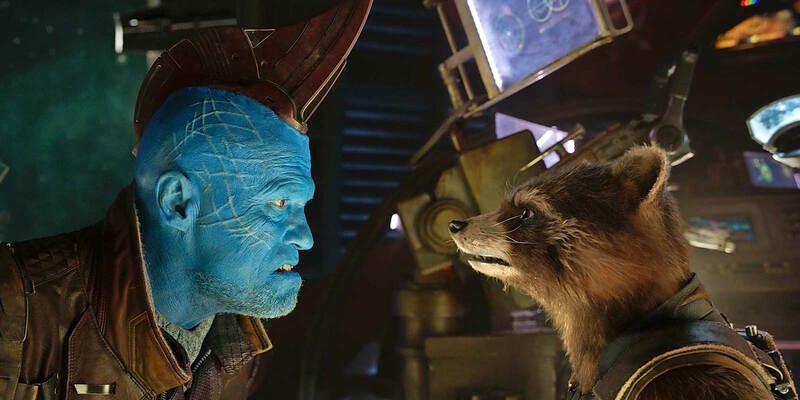 The relationship between Yondu and Rocket is one of the highlights of the film. Splitting the team up does cause some structural problems for the film. The second act feels aimless, lacking a villain or plot thread that will eventually reunite the characters. When it does kick in, the third act feels unnecessarily long, having to include a lot of exposition to explain the villain’s motivation, as well as the action needed to resolve the crisis. It is also in danger of the overwhelming special effects distracting from the emotional impact of the climax. But it wouldn’t be Guardians of the Galaxy Vol. 2 without some garish neon special effects extravaganza. Marvel fans will be delighted by the new additions to the franchise. Peppered through the film are ingenious little moments that flesh out the Guardian’s universe, from Ravager guilds to quantum asteroid fields. The film excels at inserting these nuggets of worldbuilding without dwelling on exposition. And, yes, there are five post-credit sequences. But this is not an example of over-indulgence; each one feels entirely justified, even if they are speaking to the fans in the audience. Of course, the soundtrack deserves a special mention. Gunn has cobbled together an eclectic mix of classics from the 70’s and 80’s which succeeds in rivalling the soundtrack to its predecessor. I expect this album will be a staple at house parties across the world for years to come. David Hasselhoff’s rap, “Guardians Inferno,” played during the end credits, is just as cringeworthy as you’d expect. But isn’t that the point? Despite my criticisms, the part of me that is a hopeless Marvel fan adored this film. It is likely that I am holding Guardians of the Galaxy Vol. 2 to a higher standard than other films because of the success of the original. I’ve come to expect a lot from James Gunn and his band of galactic misfits. It still reaches a high standard. It’s fun, brash, loud, and had me laughing aloud in my seat. But following the watershed moment that its predecessor represented, it doesn’t do anything new with the genre. It’s a damn good sequel, but it’s just not as fresh as the first.